The foundation of what I do as a professional coach is to combine the right mix of experience and questions to help lawyers access their own wisdom and unique abilities and use them to improve their practices. I've often written that lawyers should look at coaching, not as an expense, but as an investment in themselves and their practices. These days every investment is viewed in terms of the return it provides, and coaching should be no exception. If you want to make the decision to engage a coach, these are the three dividends that you should expect from your investment of time and money. 1) Direction. 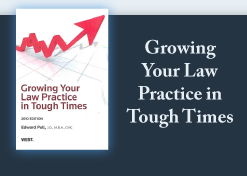 As a board certified coach to the legal profession, I show attorneys how to make their practices better and more effective, providing advice based on years of experience and years "in the field," as a practicing lawyer. Working with a coach who understands what you face provides an outlet to discuss and explore problems and offers a resource to resolve them. A coach does not need to have all the answers - rather, an experienced coach will involve you in the coaching process such that, as you gain more experience, you can give feedback to the coach, participate in the dialog, and create an active process for improvement. 2) Accountability. Acting as your own conscience for improving your practice is difficult. The more practical way is to work with a coach and have the coach provide accountability. No one wants to look foolish or unreliable before an authority figure, and failure to adhere to your own goals is failure to be reliable. Adding accountability to the role of a coach creates a major incentive. If you don't achieve priorities, the coach will show you your own unreliability and its consequences. By working with a coach, and being held accountable, priorities can be defined and achieved on an ongoing basis. 3) A colleague. The concept of accountability does not make a coach an adversary. On the contrary, a good coach, even while challenging you, should be an ally. Especially for sole practitioners, isolation and lack of camaraderie with other attorneys can be a barrier to personal fulfillment. By nature, we humans are a gregarious species and need to be connected with others. An outside perspective, from a coach can be a critical ingredient in career happiness by helping you define what you really want and working with you to achieve it. The right coach will take the experience honed by working with other successful people and use it to guide you in defining your target - and helping you hit it. As I write this, I am actually dictating this message. Today, with a brand-new computer, Windows 7 and all the accoutrements thereto, Dragon 11 was installed on my machine. I am absolutely astounded at how good this system is. I am excited beyond words, and my voice is a little bit hoarse. In past editions, the time spent "training" the system was spent mostly on educating the software. Now, my training time is spent learning the varied commands that are available to me. In other words, it is I that needs the training, not the machine. I will keep you posted on my progress, however, I can say that this clearly is worth the investment. Just another technology gadget, however, one that helps make life easier.